On Thursday, 22 Democratic congress members introduced a bill to deny funding to any escalation of war in Afghanistan, and 60 Democratic senators voted that Congress should not even speak to a general about that war until after the president has decided whether to escalate it. These two actions come out of very different understandings of war powers. The particular worldview of the 22 House members, which could also be called “The United States Constitution”, holds that the Congress alone has the power and the responsibility to determine whether wars are begun or ended, escalated or scaled back, and to raise and fund and oversee any military force necessary for fighting a war, while the president’s role as the executor of the will of Congress is to serve as the civilian commander of the military during a time that Congress has designated and in wars that Congress has authorized. This view is sometimes accompanied by the belief that elected representatives should represent the views of their constituents, even including their current views at any given moment, not just at the time of the most recent election. Given that the majority of Americans, and certainly the majority of the residents of many Democratic congressional districts, oppose the war in Afghanistan, Congress — in this “Constitutional” view — has the responsibility to block the funding of any escalation and possibly of the continuation of the war at its current level, as well as the duty to determine how the war is being conducted and to make that information known. In this same theory of government, then, Democratic Congressman Steny Hoyer (whatever his motivations) was technically right when he recently proposed that General Stanley McChrystal be brought in to testify. And so was Republican Senator John McCain. 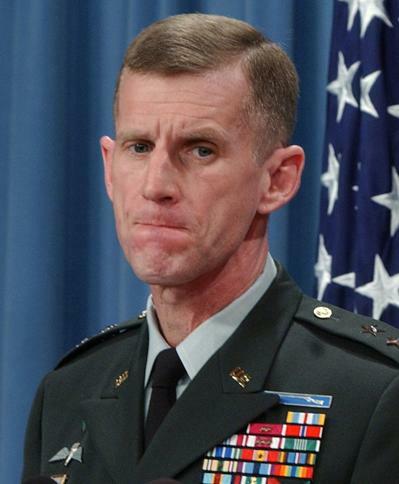 McChrystal ought to be brought in at his earliest convenience, and subpoenaed if he declines. And such a subpoena ought to be enforced by the Capitol Police, not the Justice Department. And if McChrystal’s testimony proves unsatisfactory, President Barack Obama should be brought in to testify. And if no testimony persuades the public of a need to continue or escalate a war, then — in addition to the need to end illegal, aggressive, foreign wars even if popular — such a war should be defunded. And any misspending of unappropriated funds to continue a war must be treated as an impeachable offense. At least that’s one theory. In contrast, the theory of government embodied in the vote of 60 senators (the same 60 incapable of passing healthcare reform, workers’ rights, fair trade, greenhouse gas limitations, or anything else worthwhile), their vote to NOT ask McChrystal to testify until the president has decided what to do, might be accurately labeled “elected despotism.” In this theory, civilian control over the military is maintained, but congressional checks on the power of the so-called executive are eliminated. Congress does not determine the existence or extent of wars. Congress does not deliberate upon the need to spend public resources. Congress takes its orders from the office that the Constitution that was established to faithfully execute the will of Congress. Congress spends money where the president tells it to. This theory is often accompanied by the belief that the American people can and should go cheney themselves. And it is almost by definition accompanied by the belief that Congress members should behave weakly and in a subservient manner. This means that bringing a general in, with his flashy and important uniform, would not be an opportunity to question him on how — if at all — he is serving the desires of the American people. Rather such a hearing would be an occasion for flattering a war criminal and professing one’s allegiance to military rule. Therefore, it is wiser — in this despotic theory of governance — to allow the general to pressure the president through the corporate media cartel, than to put him in a position of being questioned by congressional courtiers. On Thursday, 59 Senators voted against Senator McCain’s proposal that McChrystal appear sometime in the next six weeks, and 60 senators (including one Republican) voted for Democratic Senator Carl Levin’s amendment stipulating that McChrystal not testify until the president had already determined, independently of the Congress, whether and how to escalate a war. So, the president should decide whether or not to spend our money and lives on an illegal war, and should not even be pressured in one direction or another by Congress. It is a measure of how twisted our system of government has become that this failure of Congress is depicted as one of restraining , rather than loosing, the dogs of war. It is because senators cannot imagine themselves besting a general in a hearing, much less employing the power of the purse, that their open transfer of war-making power to a president is depicted as supposedly cooling the fires of war. Fortunately, we don’t need the Senate to end a war. We would need it to enact into law the bill that has been introduced in the House to block the funding of an escalation. But we do not need the Senate to actually block all funding for the wars. That can be done by persuading House members to vote no on “defense” appropriations or on the next war “supplemental” bill. And we don’t even need the full House in order to bring McChrystal in for questioning. A committee can do that, and every committee has the power to enforce its own subpoenas if it could only remember where it left its backbones.